The online debate was whether the dress is white and gold or blue and black. There is a right answer, by the way, and I’ll get to that below. The debate has raged for hours and hours and has been widely, globally reported (at, e.g., NBC Today, CNN, NPR, BuzzFeed, Independent (UK), Reddit, and hundreds of other places) – just search “what color is the dress” on Google right now if you haven’t yet heard of this dress. Celebrities like Ellen DeGeneres, Kim and Kanye, Taylor Swift, and Matt Lauer have all weighed in. BuzzFeed.com alone has reported over 21 Million views of this dress. 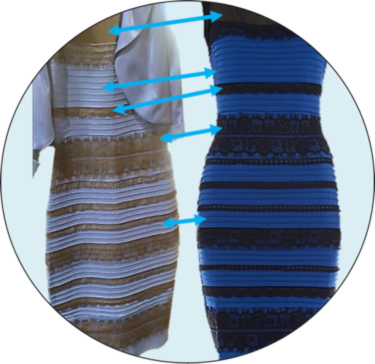 Wired.com has even gone to the length of engaging an expert to analyze the image and assign real color values to the dress’s various parts – who said it is blue and black. Even after this expert photo analysis and knowing of it, NPR’s David Greene still swore it was white and gold and told Renee Montagne she was “wrong” for believing it to be blue and black. I’ve been staring at the photo above for many, many minutes now and I must admit that I see it as pale blue with gold stripy-trim. I’m crazy (holy cow – before I got to the end of writing this article I looked back at the photo above and see it as blue and black now!). So, why does this matter to you as a litigator? It matters because THERE IS A CORRECT ANSWER HERE, but millions of people seeing actual, real evidence (the photo above) have divergent and strongly held opinions on the issue and are willing to take time out of their day to argue it. NPR’s David Greene told his coworker she was wrong about it. Folks on Gawker are insulting one another in comments debating the issue. These people are your potential jurors, and this blip on the internet’s timeline shows you that sometimes the facts are less important than perception and impression. I’m sure you can imagine a jury arguing over what is and what is not “reasonable” or whether a patent’s claim limitation is infringed by some plastic, flexible component of an accused windshield wiper blade product in a similar fashion to the folks on Gawker.com arguing with one another over a dress’s hue. This dress shows how scary this reality can be when your client’s case, life, company, and/or money is on the line. 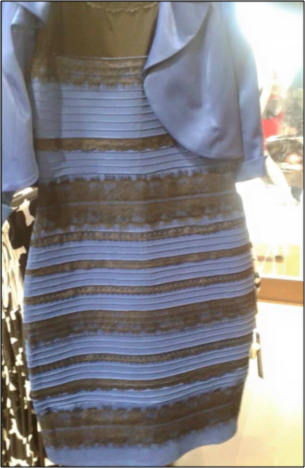 It’s pretty clear now, isn’t it, that the dress really is blue and black. How can there be any debate? What is this photo to the right? Is it actual evidence of the color of the dress above, the one the whole world is consumed with? No, it is not. What we have here in the photo to the right is demonstrative evidence. We are using it to illustrate that a similar dress, from the same company, designed in the same way as our dress-at-issue, but photographed differently, shows our dress’s actual colors. Here, it’s the only “proof” we’ll get, and this shows the critical impact demonstrative evidence (litigation graphics, scale models, animations, etc.) can have on an audience you’re trying to persuade. Whether this is real evidence or demonstrative evidence matters not to jurors according to the top jury researcher in the country (Dr. Laurie Kuslansky). Jurors simply don’t distinguish between actual evidence and what you show in litigation graphics to demonstrate your points – it’s all just “evidence” to them. Are you now convinced that the real dress is blue and black? 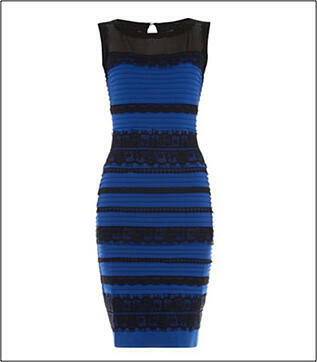 I am (however, I just looked at the real dress photo one more time and it looks blue and gold to me again).